Question 1. How would you prepare yous field before sowing seeds? Preparation of soil involves ploughing and lavelling it. Ploughing involves loosening and turning of soil using a tool or an implement called the plough made up of wood or iron. They are either drawn by bullocks or by tractors. The ploughed soil often has crumbs of soil that need to be crushed and the soil lavelled. This is achieved using a leveller. Question 2. Why is it essential to irrigate our fields? A good crop yield requires availability of the right amount of water. Minerals and fertilizers can only be absorbed by the plants in presence of water. Seeds do not germinate in the absence or scarcity of water. Hence, agricultural fields needs to be irrigated or watered regularly. Question 3. 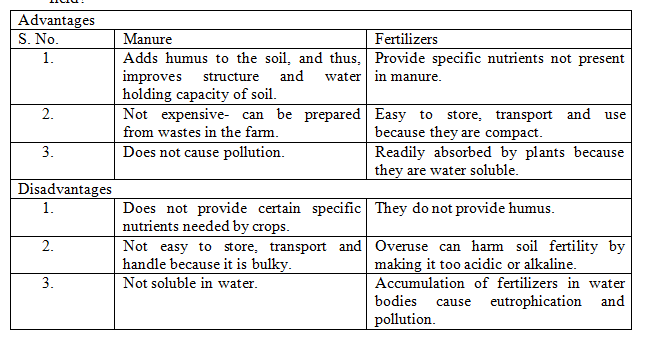 Compare the benefits and disadvantages of using manures and fertilizers in the crop field? Question 4. Why continuous plantation of the same crop in the field should be avoided? Different cops have different nutrient requirements. If you grow the same crop in the same field season after season, the soil becomes deficient in the set of nutrients needed by the crop. So it is better to grow one crop in one season and another crop in the next season. This is done by crop rotation method. Question 5. Differentiate between kharif and rabi crops with two example of each? Question 6. How is lavelling different from tilling and write the significance of these processes? Question 7. What are weeds and how do weed affect crops? Question 8. What is hybridization? Question 9. Explain nitrogen cycle? Question 10. What is nitrogen assimilation? Question 11. What is animal husbandry? Question 12. List the steps involved in crop production? Question 13. What are the advantages of ploughing the soil before sowing seeds? Question 14. What precautions should be kept in mind while sowing seeds in a field? Question 15. Why is crop rotation considered a good agricultural practice?